Whether you’re looking for a short or long term lease, you’ll find the best townhomes available at Lakeview Townhomes at Fox Valley. Call us today to learn more about living in our wonderful community in Aurora, Illinois. Come experience the luxury of your roomy new townhome in Aurora, Illinois. Our beautiful two bedroom townhomes at Lakeview Townhomes at Fox Valley are the perfect fit for your modern lifestyle. Each of our newly renovated townhomes feature a generous, open design filled with natural light. Large walk-in closets include built-in organizers *, and we offer ample cabinet and storage space to give you plenty of room to store your things. A private patio is a perfect complement to your living space. Dinner parties are a cinch with a full, upgraded kitchen filled with modern appliances and easy-to-clean countertops. Your in-unit washer and dryer save time on the weekends. Private garage parking ensures you won’t waste time looking for a spot, and we offer convenient courtesy parking for your guests. 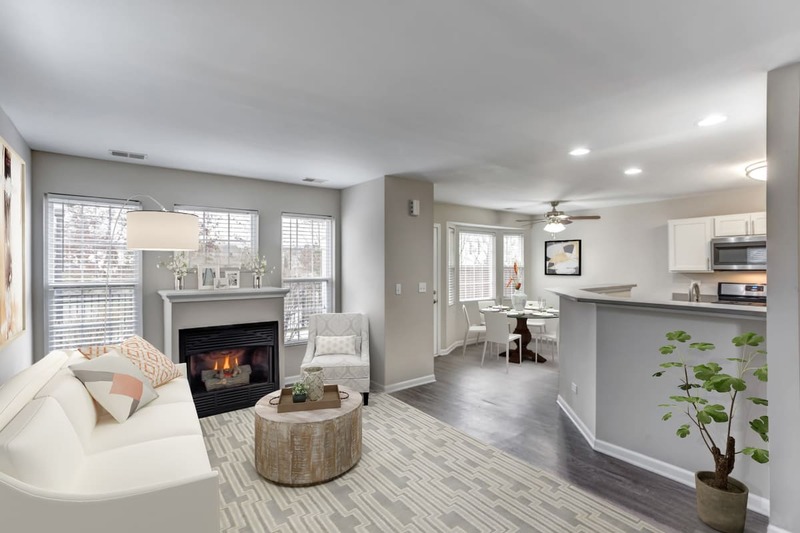 Townhomes also feature a cozy gas burning fireplace to add beautiful ambiance to your home.